Where we stopped, in reference to McNeil Point. Last Saturday we had planned to hike to Burnt Lake, but three miles from the trailhead there was a gate across the road with a sign that said “road closed for winter.” Not wanting to add six miles to our hike that day, we shrugged our shoulders and continued up the road to the familiar Top Spur Trailhead that would lead us to McNeil Point. We threw chains on the 4Runner and started our snowy accent to the trailhead. (If Michael hadn’t been there to drive I never would have made it, the roads were seriously unreal with the amount of snow they had on them!) Upon reaching the trailhead, we noticed we were the only psychopaths to have made it up for the day and we strapped snowshoes on our feet, excited to be the only ones on the trail. Fog engulfed everything around us because we were in the clouds and we crossed our fingers once we hiked high enough we’d be in the sun... although the winter wonderland we were snowshoeing through would have been reward enough; everything in the forest was covered with ice and snow. McNeil Point is technically a 10 mile hike, out and back, but we opted for a shorter 5 mile hike that takes you up to the first vantage point of Mount Hood, and then we turned around and came back. You’ll see I added a picture at the end with McNeil Point in reference to where we stopped and turned around. When we arrived at the view point we emerged to blue skies and a beautiful view of Mount Hood blanketed in thick snow. We soaked up some sun, took some pictures and enjoyed the warm air swirling up from the valley below before starting our descent back into the cold fog. 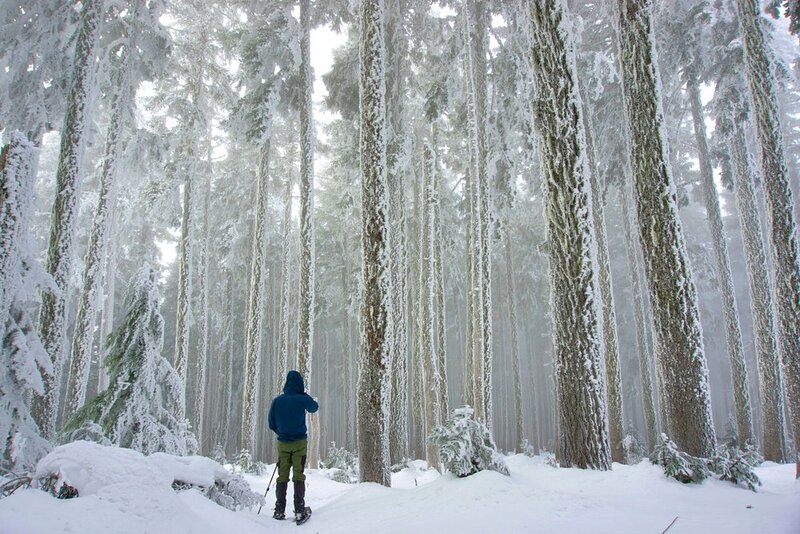 This shorter option is great for any snowshoeing (snowshoeing is harder than hiking in my opinion) or for anyone who isn’t ready to do a 10 mile hike but still wants a challenge with great views of Mount Hood.